Spinach and cheese stuffed peppers are an easy and satisfying dinner option. Spinach is combined with mozzarella, basil, feta, and Romano cheese and then stuffed into sweet Italian peppers. If you want a more hearty filling, add a whole grain like farro or quinoa. Stuffed peppers with spinach and cheese are a wonderful dish that the whole family can enjoy. Heat a griddle and place the peppers whole on the griddle to grill. When the peppers are slightly charred remove from the griddle to cool. Heat a medium sized frying pan with a drizzle of olive oil and place the frozen spinach to sauté. While the spinach is sautéing, heat a large frying pan with a drizzle of olive oil and place the garlic in the pan to sauté. Add the bread crumbs and a little more olive oil and toss. Add the sautéed spinach and grated Romano cheese and toss. If a little more olive oil is needed add it. Add the crumbled feta cheese and toss. Remove the pan from the heat and set aside. 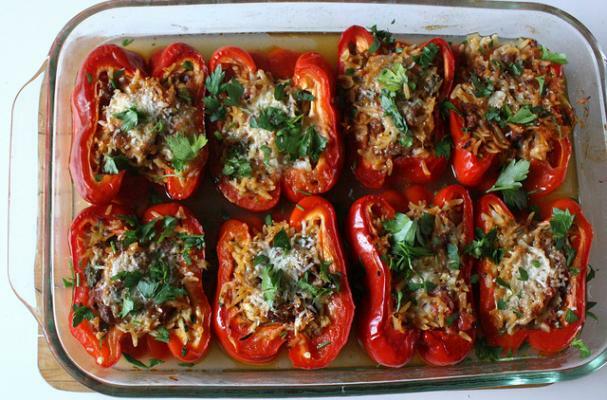 Carefully slice the peppers lengthwise and place in a baking pan. Top the peppers with the stuffing. Sprinkle grated mozzarella on top and grate a little more Romano cheese on top. Drizzle a little more olive oil over the peppers. Bake: 20-25 minutes or until the cheese is slightly golden.